Widely recognised as one of the most famous cars of all time, the sleek Aston Martin DB5 became the car of choice for James Bond in "Goldfinger". The DB5, modified by Q, included an ejector seat, machine guns, oil slick emitter, rear window shield and bulletproof glass. 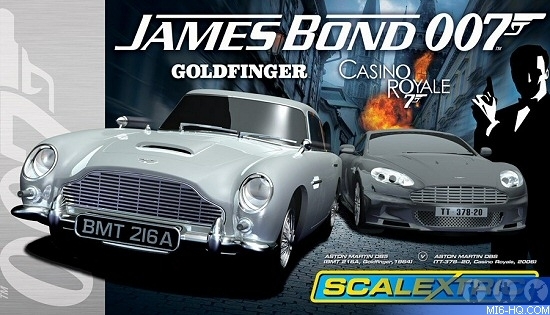 The Scalextric model typifies the beauty of this iconic car and includes working gadgets, such as an ejector seat (activated when passing the special trackside bollard) and manually-triggered rear shield. This highly detailed car features working lights, Magnatraction™ and easy change pick-ups. 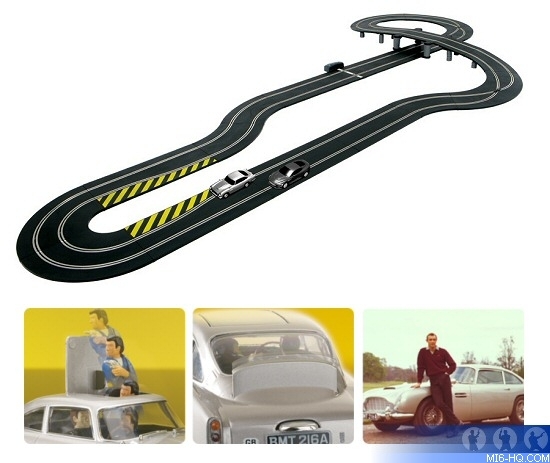 The excitement of every iconic Bond car chase is captured in this fantastic set featuring a huge, extended figure-of-eight track which includes a raised bridge section, two exciting crossover curves and a tight hairpin. The Super Resistant Aston Martin DB5 and Aston Martin DBS feature easy change pick-ups and Magnatraction™ to help them stay on the circuit.